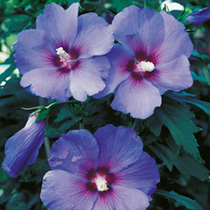 Hibiscus syriacus 'Marina' is an upright deciduous shrub with green foliage appearing in late spring. It produces large lavender flowers with red centres from late summer to early autumn. May grow as tall as 3m and their spread could be up to 2m. Supplied in a 7.5-10 litre pot.